Designed for both fuser oil and oil-less laser printers and copiers. 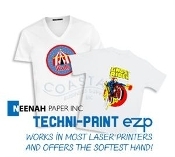 Techni-Print EZP is the perfect fit for transferring personalized photos and images to light colored shirts, sweatshirts, mousepads, coasters, puzzles, leather and other materials. Eliminates background polymer window! For light colored fabrics. Transfers color text/graphics to dark garments without backgrounds! Transfers color text/graphics to dark garments with no backgrounds! Perfect two-step self-weeding paper system for OKI White Toner Printers! Works in most machines with or w/out fuser oil. For use on dark fabrics. Works in most machines with or w/out fuser oil. For use on dark fabrics. Click for Quantity Discounts! Self-weeding transfer paper for light/white fabrics that applies in one press step -- perfect for white toner and CMYK laser printers! Parchment paper for heat transfers!